“Back home in lovely and sunny Brazil, my home country, which I must admit that I was missing a lot. After an unforgettable season in Europe, I turn to my roots. 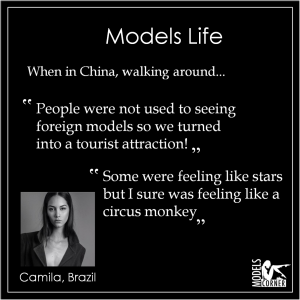 The fashion world is incredible and unique; we can meet amazing people, get to know new places (when we have the time…), trying different foods, living amazing experiences… and at times some unpleasant ones (that’s life!). Ok, getting to really fun part of the story. Try and visualize a small town where people are not used to seeing many foreigners. When they saw someone who did not have slanted eyes and super average height it turned into a major tourist attraction – the animal in a zoo kind of tourist attraction. One day my roommates and I were going to a casting with our bookers, but we arrived early and we decided to stop at a plaza to pass some time. In less than 5 minutes we were surrounded by many Chinese people. You can imagine what came next… Picture time!! They were going picture crazy on us, selfies, videos, the whole routine. All of us were having so much fun about the whole situation! We were feeling like stars (for sure I was feeling much more like a circus monkey! ).